Researchers have been able to improve the efficiency of solar cells by coating the cell surface with extremely small nanoscale structures. 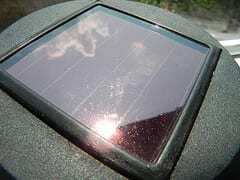 The new technology has been shown to nearly eliminate the reflection losses of solar radiation. Cost-effective solar photovoltaic materials are being developed within the Academy of Finland’s research programme Photonics and Modern Imaging Techniques. The nanostructured black silicon coating features very low reflectivity, meaning that a larger portion of the Sun’s radiation can be exploited. At Aalto University, a research team led by Assistant Professor Hele Savin is conducting studies on crystalline silicon solar cells, which are the main type of solar cells that are currently on the market. “The advantages of silicon include the long-term stability, sufficiency, low cost and non-toxicity of the element, as well as the advanced production technology. Another benefit of these solar cells is their relatively high efficiency and technological compatibility with the manufacturing technologies currently used by the semiconductor industry,” Savin explains. The technology, however, still calls for development and improvement. According to Savin, the researchers are motivated in their work by the fact that the manufacturing technology players are major corporations in the industry, which allows for immediate large-scale experimenting of new ideas and improvement methods in collaboration with the partner corporations. The efficient operation of solar cells may be compromised by impurities in silicon. In solar cells, it is not possible to use as pure a form of silicon as in, for example, microelectronics, and thus they exhibit a higher degree of impurities. Moreover, the solar cell utilises the silicon disk in its entirety, whereas transistors, for example, are located on the surface of the silicon disk, and accordingly, impurities cannot be controlled in solar cells by means of the same methods as those used in microelectronics.